For Low Back Pain Relief Andy signed up for the back pain diagnostic service. This meant going to the http://www.globalbackcare.com website and sending me some photos of himself in various postures. He's not in bad shape actually, strong, close to his ideal wight and trains regularly at the gym. His back started hurting after he started a sit down job five years ago. He's a bit tight in calf, hamstring and buttock muscles, more so on the right side than the left. He's now got the exercises and I think the prognosis is good. In view of the fact that he said sitting down might be contributing to the problem I penned this article and sent him a copy. Here are seven secrets for sitting down painlessly that will provide you with low back pain relief. Your abdomen must be pressing in to the desk and the back of the chair upright and pressing in up under your shoulder blades. You're locked in, sitting up straight, hollow in lumbar spine. Spend some time each day standing up. Put a box on your desk big enough to fit your keyboard and your mouse. Get yourself a Balans Chair. Spend some time each day on it. The reason these chairs work to provide low back pain relief is because they eliminate the effect that tight hamstrings and buttock muscles have in stopping you from sitting up straight with the 'S" shaped curve in your spine. 'They' say not to spend all your time on it as it may impact on your knees. Some of the day is good - as it sitting with stomach against desk and standing up. 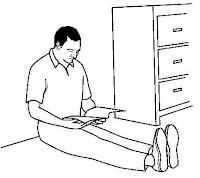 Sit on the floor with legs straight out - particularly if all you're doing is reading. Build up your situps, feet held to 40, on the trot. Build up your pressups to 40, on the trot. Pressups not only strengthen arms and shoulders but also your trunk muscles, front, back and core. Do Superman and cobra for a minute a day. In the meantime stay tuned, highly tuned and sit up straight. You're not alone if you have back pain while you're lying in your bed trying to get to sleep. You can't sneeze or cough without it feeling like there's a red hot poker in your back. You can't turn over without experiencing the same sensation. You blame your bed. You get a new one. The pain doesn't go away. You've done your dough. What few people realize is that the pain is a symptom of bones that are out of alignment. Get the bones back into alignment and the pain should go away. It's not as tough an assignment as you might think. All you have to do is spend a couple of hours a night working on it doing a few simple exercises. Most of those exercises don't involve any effort, just you lying on the floor relaxing off. Your lower back pain sleeping is not going to go away over night. There is no magic wand you can wave over it, though some of the concoctions your chemist might dispense could go part of the way to giving you a better night's sleep. However lower back pain is not caused by a lack of Panadeine Forte or Celebrex. You can ice and heat the area. The will settle it down a little. Ice and heat work together to relieve inflammation. Especially don't overlook ice. Wrap a piece of cloth around your body and stick an ice pack down it. Get two or three ice packs so you can keep replacing them as they warm up. Lower back pain sleeping isn't caused by a lack of ice or heat either. This treatment is palliative. You'll be more comfortable but you're not getting better; yet! Before you go to bed spend as much time as you can lying on your back with both legs on a chair, knees bent at 90% and the lower leg resting on the chair. This will help the soft tissues of your back settle down. In bed, lying on your back with your legs on a couple of pillow will give you the same relief. BUT, your lower back pain sleeping is not caused by a lack of pillows under your legs. The main cause of back pain is vertebrae that are out of alignment. The main cause of vertebrae being out of alignment is a pelvis that is out of alignment. The main cause of a pelvis that is out of alignment is tight hamstring and buttock muscles. So if you want to fix back pain you're going to have to loosen some of these muscles. In the Fix Back Pain ebook I show you how to do that. It's not rocket science. All if takes is a couple of hours on the floor every night for a couple of months, loosening tight muscles and strengthening weak muscles. If you're more than 15Kg over weight there's a high likelihood you're setting yourself up for lower back pain sleeping. If you can't do 20 situps, 20 pressups and 20 squats you're not fair dinkum about keeping your pelvis and vertebrae in good alignment. 20 of each is a minimum. When you can do 40 of each report back. So there you have it. If you want a good, pain free night's sleep you've got to be strong, flexible and thin. In the meantime stay tuned, highly tuned and remember, it's what you do on the floor before you go to bed and what you do in the gym that gives you a good night's sleep. Is is possible to cure back pain? It's hard to be definitive about it, but my rule of thumb says that there's an 80% chance that for 80% of people they they can get their back back to 80% of good shape if they're diligent. 80% of that fix will come from what they do for themselves. They may be able to speed up the rehab process with various physical therapies, but the prime consideration is improving their own strength and flexibility. This of course is not something you can sub-contract out. So if you want to cure back pain get cracking. In the Fix Back Pain ebook I show you where to look for clues as to what's caused your problem. I can tell you one thing. It's highly unlikely that the cause of the pain is at the site of the pain. 80% of people with lower back pain are suffering from a dysfunction not an injury. It is their own muscles - usually tight hamstring and buttock muscles that are the cause of the problem. Not only can I tell you why this has happened but I can give you the exercises you need to do to restore poor function to good - to cure back pain. It won't happen overnight; how can it? It's taken years for tight and weak muscles to draw first your pelvis and then the bones above it out of alignment. But doing a series of exercises, on the floor in front of TV, every night for a couple of months should see a dramatic improvement in your condition. Gradually, fractions of a millimetre at a time your bones will gradually get back into better alignment. When that happens the pressure will be released on the muscles, tendons, ligaments and discs in your lower back. You'll be able to stand up straight, you'll be able to bend over and pout on your socks, you'll be able to sneeze without it feeling like there's a red hot poker in your back. You'll be jumping out of your skin. So, there you have it. I reckon there's a good chance you can cure back pain. It all depends on what you to do yourself. You can find out what you need to do by going to www.globalbackcare.com. In the meantime stay tuned, highly tuned and spend time each night loosening off tight muscles and strengthening those that are weak. The Achilles tendon is a very strange animal. Just when you think it's coming good it snaps back at you. There are (at least) three keys to solving the problem of Achilles tendon pain. 1. You'll get small bit of relief from a number of strategies, it all adds up. 2. There are lot of things you can do. 3. Persistence. If you think you're getting better, don't slack off on what you've been doing. There are a few other things to take note of. Finding the cause of your Achilles tendon pain problem likely to be more difficult than finding the cause of lower back pain. Below the tendon it could be your foot strike and whether you excessively pronate or supinate. You need to go and see a good sports podiatrist to find out whether that is the case or not. You may come away with wedges for your shoes or an orthotic. You might blanch at the cost of the orthotic - but it if does the trick then it will be worth every penny. It could save you months of angst, frustration and money on physiotherapy treatment and massage. It could be the way you land. The experts say you need to run more on the balls of your foot than your heels. The experts are also starting to say you need less cushioning in your shoes, that you don't need expensive Nike running shoes, where most of the money ends up in the pockets of people like that rascals Tiger Woods and Michael Jordan! However, they also say that if you're going to adopt this strategy you need to start working ogradually on the beach or on grass. You can use it on yourself four or five times a day or get a partner to give your legs a really good rub down at least once a day. How do I know? I've had Achilles pain and The Stick seemed to make a big difference. Then there are strength and flexibility exercises you need to do to strengthen and loosen your calves. You've just got to keep doing them. And, more than any other musculo-skeletal complaint, ice seems to be a very effective way to reduce the inflammation and pain. I found extended periods of icing, hours at a time with an ice pack stuck down the back of a neoprene anklet, to be effective. If you've got a couple of small ice packs, (the packs that you stick in lunch boxes) you can rotate them through your freezer and have one on the go for most of the day and night. Let's face it, if you've got Achilles tendon pain you're dealing with a monster. I'd hate to put the mockers on you but if you fail to do anything about it and it could last for years. It would be an exceedingly brave man who said they have all the answers. However, I think I have some of them in the ebook, Fix Achilles Tendon, Calf and Shin Pain which you can get from the www.globalbackcare.com/achilles-tendon-pain/ website. Hippocrates said that the physician speaks with more authority if he's had the disease. Well I'm no physician, just a humble physical educator, and Achilles tendon pain is not a disease, but I've had Achilles tendonitis and gradually, bit by bit it's gone. In the meantime stay tuned, highly tuned and tread softly. My back used to hurt. It hurt to bend over the basin to brush my teeth. It hurt to sneeze and cough. It hurt to bend down and put on my socks. But the pain has gone. It started going after I got serious about doing the exercises I now recommend in the Fix Back Pain ebook, available from the www.globalbackcare.com website, kit took a couple of months. That was 10 years ago. Now, whilst I'm not 97% fat free I am 97% pain free. My back is in good nick. So here's what I suggest you do if your back hurts. 1. Start going to the gym and embark on a good, all round, general strength training program. Include exercises that strengthen your trunk, front, back and core. 2. Start doing situps and pressups every day at home. The pressup is highly beneficial in strengthening not only your arms and shoulders but also your trunk. 3. Start doing the flexibility exercises I recommend in the Fix Back Pain ebook. There's quite a few you won't have seen before and which will speed your recovery. I'll show you some of the best hamstring and buttock stretching exercises you've ever seen. To get you started I've got a Fix Back Pain starter pack. You can have that and the ebook, Causes of Back Pain, Shoulder Pain and Neck Pain with my compliments. In the meantime stay tuned, highly tuned and strengthen the muscles that are weak and loosen the muscles that are tight. With lower back pain there is always the inclination to want to stretch the spot where it hurts. It just so happens that whilst you might get a warm feeling under your singlet for a few hours it's not much more benefit that warming it up under the shower for 20 minutes. Lower back pain is rarely caused by tight muscles at the spot where it's hurting. Any muscle tightness in the lower back region is caused by muscles further down your body pulling your pelvis out of alignment. When that happens the bones of the vertebrae above the pelvis are drawn out of alignment in sympathy. Muscles, tendons and ligaments are stretched beyond their pain threshold. What you have to do if you want lasting relief is to loosen off the muscles that are drawing your pelvis out of alignment, your hamstring and buttock muscles. What I've got for you in the Fix Back Pain ebook on the www.globalbackcare.com website is a series of exercises designed to settle the back muscles down. That will definitely give you some palliative relief. However to fix the problem you're going to have to spend time doing exercises for lower back pain each evening on the floor while watching TV - not only doing the relaxing exercises but doing the gentle exercises which gradually loosen off tight hamstring and buttock muscles. It doesn't happen over night. Rather it happens fractions of a millimetre at a time, day in, day out over a period of a couple of months. In the meantime stay tuned, highly tuned and remember, the exercises for lower back pain are exercises that loosen off your hamstring and buttock muscles. It's interesting. If you look through a lot of the medical literature you'd think that back pain came out of the blue. In the majority of cases of acute low back pain (approximately 95%), no specific diagnosis can be made nor needs to be made. This is just bunkum. Name something else that doesn't have some sort of a cause. I can tell you the most likely cause - tight hamstring and buttock muscles that take the pelvis out of alignment. Do that and the bones of the vertebrae above it go out of alignment in sympathy. Then the muscles, tendons and ligaments are stretched beyond their limit. You experience pain. Then discs are squeezed out. When the nucleus hits your spinal cord it hurts like hell. The other part is a lack of strength to keep the spinal column in correct alignment. There is insufficient evidence to recommend specific exercise programs (e.g. stretching, strengthening, side bends, flexibility/mobilising exercise, or aerobics) over no treatment for workers with acute low back pain. The McKenzie exercise, however, may have some benefits over no treatment for workers with subacute low back pain (Grade C). More bunkum. If the cause of the problem is weak and tight muscles you'd think that strengthen ing the weak and looening the stong would b the obvious thing to do. There is insufficient evidence to recommend that specific exercise programs (e.g. graded activity, strengthening, stretching, aerobics, extension and flexion exercise) are superior to other conservative treatments or usual care. So what is usual care for lower back pain? A rub down, hot wheat pack, pain-killing pill and a lie down. Just ask yourself if this is the type of treatment you'd expect an elite athlete with lower back pain? Well one of the first things you can do is ignore most of the stuff you read from the National Health and Medical Research Council, refereed medical and physiotherapy journals and the Cochrane Collaboration. That's where the group who put together these recommendations got their informastion. The second thing you can start doing is the exercises I recommend in the www.globalbackcare.com series of ebooks. In the meantime stay tuned, highly tuned and spend some time each evening, on the floor in front of TV doing your exercises. A lot of people suffer from upper back pain. They're always hanging out for a massage between their shoulder blades. They’re always hanging out for a shoulder massage and love having someone massage the spot in between their shoulder blades. If you sit down with your abdomen six inches away from your desk and the back of the chair sloping backwards, your pelvis tilts back, you lose the nice ‘S’ shaped curve of your spinal column – it becomes a ‘C’ shape. The upper part of you back is an inch or two forward of where it ought to be. The extra weight of your shoulders, neck and head puts increased tension on ligaments, tendons and muscles in your upper back. Eventually bones get moved out of alignment and that’s when it really starts to hurt. That’s because the cause of the pain is not due to a lack of crunch or rub down. 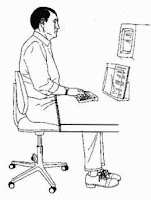 The first thing is to do the ‘sit-up-straight’ exercises outlined in the Fix Back pain ebook at www.globalbackcare.com. There are three of four must-do exercises to get you sitting up straight. In the meantime stay tuned, highly tuned and remember, it’s a big ask expecting to get better by having someone do something to you; sooner of later you have to do something to yourself. For sometime now I’ve had Achilles Tendonitis. I’ve tried a lot of things – stretching, strengthening and ice down the back of a neoprene anklet. All useful. BUT, lately I’ve taken to using THE STICK, an invention of www.thestick.com which involves a small set of rollers on a stick being used to massage your calf muscles and the Achilles tendon. It works. It’s taken pressure off the Achilles and I’m feeling heaps better when I run. The rollers get right in and start to loosen up knots in my calf muscles. I’ve had tight calves for donkey’s years. Nothing has loosened them up like The Stick. I’ve tried stretching, but on its own it hasn’t made the big difference I was looking for. I’ve had massages but unless you’re King Farouk you can’t afford 100 bucks a day for calf massages. Often I’ll use The Stick five or six times a day for half a minute or so on each leg. I start with the right calf for half a minute, then the left calf, back the the right and then back to the left. If I ask politely, Christine will give me a workout for a few minutes. I lie face down on the bed and she gets to work with the rollers. She can feel the knots in the tight calves and works on them. I’m not suretwhat those ‘knots’ are, but they must be extraordinarily tight spots in the calf. It’s amazing really, she works on one leg, then the other and coming back to the first leg the knot(s) have disappeared. It’s like the muscles relaxes while you work on the other leg. So,there you have it. I recommend the The Stick. I recommend you use is a number of times during the day. I recommend you getyour wife, partner, children or mate to give you a better workout than you can give yourself. I also know that the stretching and strengthening ewxercises you do yourself, and ice down the back of the neoprene anklet are necessary parts of the rehab process. The Stick speeds up that process. In the meantime stay tuned, highly tuned and get yourself The Stick. Whenever I conduct a CrookBack Clinic, I find that around 50% of people have some sort of musculo-skeletal complaint. Most of these people have bodies that are out of alignment. Some muscles are too tight, some are too weak. That's the bad news. The good news is that by doing the right exercises there's a good chance those bodies can get back into better alignment. The pain goes away. Many of the people I see are lacking in strength. In fact the best predictor I know of risk of a crook back is your ability to do pressups. I see a lot of people with sore necks, shoulders and wrists who don't have a regular and systematic training program. I've got a special suite of exercises for these three dysfunctions. Anyway to cut a long story short, the ebooks that I've got for you will take you through the likely cause of your dysfunction and provide you with a wide range of exercises designed to restore poor function to good. Is this a quick fix? Nope. Is this a quack fix? Nope. Does it require any effort? Yes and no. Surprisingly many of the most beneficial exercises I've got for you can be done on the floor while you're watching TV. The strength training program does, however need some effort. Gradually over the weeks and months you can strengthen weak muscles and loosen tight muscles. Gradually, millimetre by millimetre your body will get back into better alignment. Stronger muscles will support it in better alignment. When that happens there's a very good chance your pain will go away. Here's the link to the Global Back Care website. If you've got friends, relatives or work colleagues with musculo-skeletal pain, flick them a copy of this blog. They'll be glad you did. If you live anywhere in Australia and workplace would like me to come in and run a series of CrookBack Clinics drop me a line. If you live in Canberra and would like a personal consultation I'd love to hear from you. In the meantime stay tuned, highly tuned and start doing situps and pressups.